St Joseph’s Primary School, as a Catholic school promotes the basic British and Christian values of democracy, the rule of law, individual liberty, and mutual respect and tolerance for those of different faiths and beliefs, further details can be found in the British Values section of our website. You can view or download overviews of subjects and topics taught throughout the school year. Below you can see each classes Yearly Overview of the curriculum. Teaching children to be good, confident and fluent readers is an essential life skill. From when children enter school, they are taught phonics, which is understanding and applying letters and sounds in order to read and write. In EYFS and KS1, phonic lessons are delivered every day through the Letters and Sounds programme alongside Jolly Phonics. In KS2, phonic lessons are necessary for some children, but the curriculum changes in its delivery. More time is spent on guided reading sessions, comprehension lessons and whole class books. Children must be able to read accurately, but to also digest and understand the words in context. It is imperative that children are reading both at home and school, as it is such an important life skill, and we ask that you would support us with this- either with your child’s reading book, word/sound cards or other material at home that you deem appropriate. Here at St Joseph’s we want children to develop a love for books and enjoy the reading experience. 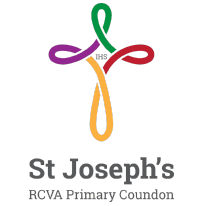 At St Joseph’s RCVA Primary school we believe that inclusive education means providing all pupils with appropriate education and support alongside their peers. The Curriculum is all the planned activities that the school organises in order to promote learning, personal growth and development. Our broad curriculum meets the diverse needs of all our pupils including SEND pupils. Through high quality teaching and differentiated activities children are given many opportunities to access learning and achieve.